Tonight, President Trump will speak to Congress and the American people in his first official State of the Union address. 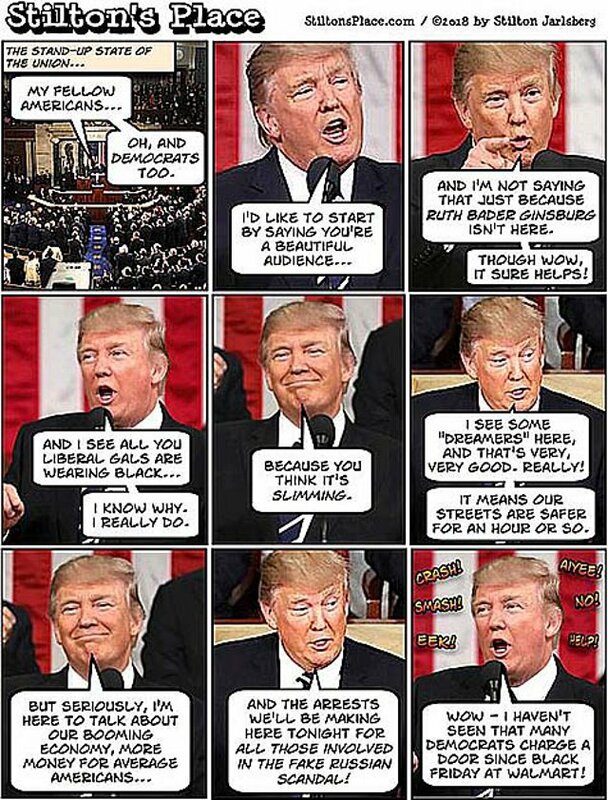 But, no matter what the content of President Trump’s speech is; no matter how he delivers it; no what else may portend, both the Lamestream Enemedia and the Democrats’ will portray it as one long stand-up comedy routine filled with offensive humor. So, hey! Why not run with that idea? Enjoy! Be assured of one thing, My Fellow Americans; the Democrat politicians at both state and federal levels are not so enamored with immigration, legal or otherwise, out of any sense of compassion for these foreigners – especially the ones from the world’s shitholes. No, they’re just fishing for votes and tax dollars just as they always are. This is not to say that these Dems are trying to- or expecting to get noncitizens to vote for them. No, thankfully, that sort of voter fraud is statistically nonexistent. 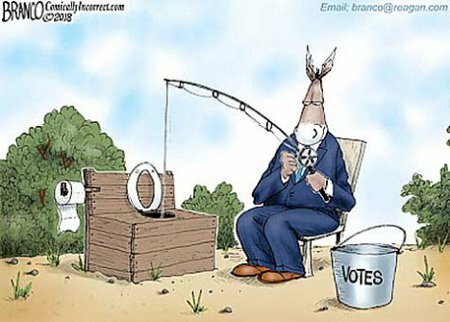 No, the primary sort of votes the Dems are fishing for is Electoral College votes and seats – hence, votes – in the US House of Representatives. Truthfully, if they want to stay even marginally relevant in the post-2020 future, they have to keep fishing for immigrants. Americans and long-term foreign residents are fleeing the Blue States. The only thing allowing these states to mitigate the effects of this is through foreign immigrants like New York and California do. But, of course, these Dem politicians are also looking for votes for themselves from their Liberal and Progressive constituencies, constituencies that have proven to be both rabidly fanatical on non-White immigration and prone to extreme responses to perceived waffling on this issue at all. Well, this is true of White Democrats at least. The Congressional Black Caucus is a bit more specific in their support for immigration from shithole countries. It’s really just simple math – arithmetic really – much of the taxpayers’ monies distributed to the several states is done so based upon population either directly or indirectly. Given that the Dems’ bailiwicks would be in a rather steep population decline, they need immigrants, legal or otherwise, to bolster those numbers, lest they lose out. And, lest we either forget or simply turn a blind eye, immigrants, mostly illegals, provide the labor force for many businesses that thrive in the urban zones where Democrats also flourish. That brings in state level tax dollars and resultant clout into these Democrat politicians grasp. A perfect example of this being the plethora of nail salons in and around NYC which are owned by Asian legal immigrants who, in turn, “hire” illegal immigrants – some of whom are victims of human trafficking – and keep them essentially enslaved and living in squalid conditions. Another example would be the various sweatshops that proliferate in urban, i.e., Democrat, zones such as NYC or Chicago. These industries, some of whom can only be competitive against foreign companies through enacting the same horrid conditions as the sweatshops in the Third World, all provide taxes to the states. Frankly, given that, it’s not even surprising that Rep. Debbie Wasserman-Schultz (D-FL 23), former Chair of the DNC, said that illegal immigrants were the backbone of the economy. Yes, do always remember that, whenever a Democrat politician makes a strong statement in favor of increased immigration, it’s not about compassion; it’s about and only about, self-interest and the interests of the Democrat Party professionals. I’m an American and I’m staunchly in favor of controlling immigration and greatly increased border security. I can also see where a wall along the US’ southern border will help with that. At 1,954 miles in length, much of it through remote and harsh terrain, it can’t be successfully guarded without something to channel invaders and provide choke points. Face it head on with clear eyes and a resolute demeanor; something has to be done about the approximately 500,000 illegal borders crossings from Mexico to America per year. That being said, to paraphrase or riff upon Pres. Ronald Reagan, “Mr. Trump, build those gates.” Not all of the immigrants, illegal or not, are either bad or problematical. A plethora of these immigrants would be of great benefit America and Americans in so many beautiful ways. Their silence is complicity. By that I mean the lamestream enemedia’s utter silence upon a A Chicago resident’s filing of paperwork with the Federal Election Commission (FEC) to create a new political action committee (PAC) named “I AM GOING TO ASSASSINATE PRESIDENT DONALD J TRUMP,” not Sen. Cory Booker’s recent full-on feral verbal assault upon Department of Homeland Security Secretary Kirstjen Nielsen. No, in the four days since various independent news outlets broke this story, the MSM has stayed utterly silent upon it. Of course, one could easily argue that it isn’t truly newsworthy given that idiots behave idiotically every day and such things as this don’t warrant national coverage. Well, one could fairly do so if poets didn’t make national news and get federal prison time. Well, one could fairly do so if rodeo clowns weren’t used by the MSM to foment national unrest. Hence, the MSM is complicit in such things and, as well, they actively foment open rebellion against President Trump and our GOP-led government. This is a large part of why they refuse to report upon anything that doesn’t fit in with their agenda and why they often “mistake mistakes” and report outright falsehoods when such falsehood are negative towards President Trump or his family.